SHANKHNAD.ORG: Battle of Imphal's 70th anniversary-Forgotten heroes. Battle of Imphal's 70th anniversary-Forgotten heroes. Commonwealth War Cemetery, Imphal, Manipur (Photo credit: Dinodia/Corbis) two battles resulted out of the 1944 U-Go Offensive of the Japanese 15th Army under Lieutenant General Renya Mutaguchi. The plan was to conquer India and use it as a launchpad of future Japanese military campaigns. Imphal, which was heavily invested by the 15th and 33rd divisions of the Japanese 15th Army, was defended by the IV Corps of the British Fourteenth Army, comprising the 17th, 20th and 23rd Indian Infantry Divisions, including the 50th Indian Parachute Brigade. London-based Japanese filmmaker and actor Junichi Kajioka will hold a premiere of his World War II epic "Imphal 1944" on Saturday to mark the end of the 70th anniversary celebrations of the Battle of Imphal to acknowledge the role of the 2.5 million (25 lakh) soldiers who fought by the Allies' side in the Second World War. Thousands of soldiers, belonging to both the Japanese and the Allied Forces, were killed and maimed in several high-pitched battles across Manipur, a significant, but forgotten, theatre of WW II. Notably, the twin battles of Imphal and Kohima have been called "the greatest-ever battle involving British forces" by the National Army Museum, London. 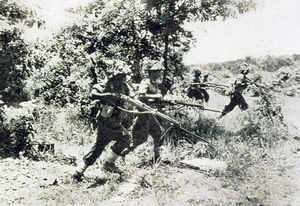 Indian troops charge a Japanese position during the Battle of Imphal in 1944. Times of IndiaYet the truth is the battles of Kohima and Imphal, in fact the whole of the Burma Campaign, was the swansong of the old Indian Army. It was for the first time that the Indian Army fought a foreign invader on Indian soil—a subtle transition for a force that for centuries had been an imperial strategic reserve, an instrument of colonial expansion and retention of the British Empire. And it was the first time that the seemingly invincible armies of the Empire of Japan were decisively beaten by the same Indian soldiers whom the Japanese perceived as lesser men. Yet the truth is the battles of Kohima and Imphal, in fact the whole of the Burma Campaign, was the swansong of the old Indian Army. It was for the first time that the Indian Army fought a foreign invader on Indian soil—a subtle transition for a force that for centuries had been an imperial strategic reserve, an instrument of colonial expansion and retention of the British Empire. And it was the first time that the seemingly invincible armies of the Empire of Japan were decisively beaten by the same Indian soldiers whom the Japanese perceived as lesser men. Yet the truth is the battles of Kohima and Imphal, in fact the whole of the Burma Campaign, was the swansong of the old Indian Army. It was for the first time that the Indian Army fought a foreign invader on Indian soil—a subtle transition for a force that for centuries had been an imperial strategic reserve, an instrument of colonial expansion and retention of the British Empire. And it was the first time that the seemingly invincible armies of the Empire of Japan were decisively beaten by the same Indian soldiers whom the Japanese perceived as lesser men. "The two world wars showed the fighting quality of the Indian soldier to the world. Victory in the Second World War has been, by far, our biggest military achievement, yet nobody in India talks about it. It's such a sad state of affairs that the country that sent the largest voluntary army in history to fight that war has forgotten the sacrifices of the millions of men and women. We expect the Narendra Modi government to do something about it. Read more- HERE "The two world wars showed the fighting quality of the Indian soldier to the world. Victory in the Second World War has been, by far, our biggest military achievement, yet nobody in India talks about it. It's such a sad state of affairs that the country that sent the largest voluntary army in history to fight that war has forgotten the sacrifices of the millions of men and women. We expect the Narendra Modi government to do something about it. Of course, we are late, but better late than never," said Lieutenant Colonel (retd) Anil Bhat, the former spokesperson of the defence ministry and Indian Army. "The two world wars showed the fighting quality of the Indian soldier to the world. Victory in the Second World War has been, by far, our biggest military achievement, yet nobody in India talks about it. It's such a sad state of affairs that the country that sent the largest voluntary army in history to fight that war has forgotten the sacrifices of the millions of men and women. We expect the Narendra Modi government to do something about it. Of course, we are late, but better late than never," said Lieutenant Colonel (retd) Anil Bhat, the former spokesperson of the defence ministry and Indian Army. Kohima, on the other hand, was defended by just 1,500 men of the 1st Assam Regiment, Assam Rifles, and 4th Queen's Own Royal West Kent Regiment. But they held off 15,000 invading Japanese for two weeks until they were relieved by the 161st Indian Infantry Brigade, a vital component of the battle-hardened 5th Indian Division. Incidentally, in Imphal, the Japanese were assisted by the Indian National Army, which had another objective apart from fighting: to try and make soldiers of the Indian Army defect. This strategy, of course, didn't work. There were a few desertions, no doubt, but for every Indian Army soldier who switched his loyalty, 68 remained loyal. On July 3, 1944, the Japanese decided to retreat to Burma, but the retreat became a rout. Thousands of sick and wounded Japanese soldiers died by the wayside and were never cremated. London-based Japanese filmmaker, Junichi Kajioka, has made a film on this, named Imphal 1944. It will be screened in Imphal at the closing ceremony on Saturday. "Many Japanese still come to Manipur every year in search of the bones of their family members who lost their lives in this war. The battles of Imphal and Kohima are not forgotten by people, and a lot of unburied souls are still sleeping in Northeast India and the border of Myanmar. I believe they are still being taken care of by the people here. My film aims to be a symbol of peace between Britain, Japan and Manipur. The film offers the world an important message of friendship between old enemies," Kajioka told this correspondent.